The future looks bleak for the loss making Hidden Valley mine, which could be closed down within 12 months according to The Australian newspaper [see story below]. Hidden Valley is jointly owned by Newcrest and Harmony Gold. The latest financial figures from Newcrest show production costs of $1,564 an ounce are outstripping the price of gold. According to The Australian, Newcrest are “reviewing all strategic options in relation to the future “ and “without further investment in pre-stripping operations, the mine will halt in about 12 months”. Leading gold producer Newcrest is set to resume dividend payments after a three-year hiatus despite finishing off the 2016 financial year with a weak June quarter production report. Underpinning the resumption of dividends expectation was Newcrest’s $US800 million or 27 per cent reduction in net debt in the June year to $US2.1bn, helped as it was by strong margins of more than $US400 an ounce. The debt level is down from peak debt of $US4bn in 2013, the last time dividends were paid. Analysts expect Newcrest to announce at least a US5c a share dividend when it releases its results next month. That is expected to be US10c a share for 2017 and as much as US40c a share in 2018. The group’s June quarter production report, released yesterday, was disappointing across all operations, according to Credit Suisse mining analyst Michael Slifirski. Gold production for the period of 598,037 ounces was below the 636,521 ounces in the preceding March quarter, and all-in sustaining costs rose by 9 per cent $US787 an ounce. Production for the full year was marginally higher at 2.4 million ounces, just over the line to meet the group’s guidance for production of between 2.4 million to 2.6 million ounces. Chief executive Sandeep Biswas said Newcrest had delivered a solid performance considering challenges at some sites. “The 27 per cent reduction in net debt reflects our focus on cash generation,’’ he said. Gosowong’s overall output was down from 38,865 ounces in the preceding March quarter to 17,644 ounces. 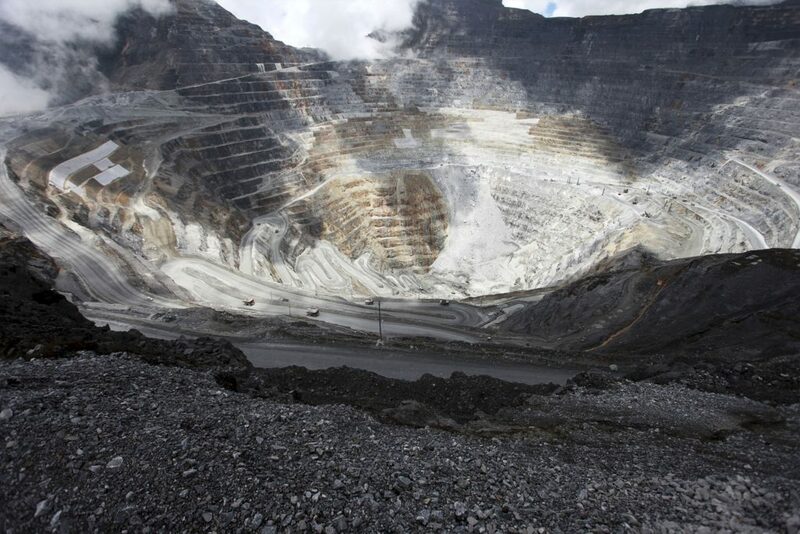 At the half-owned Hidden Valley mine in PNG, lower grade and lower treatment rates brought a production cost blow-out to $US1562 an ounce, up from $US542 an ounce in the preceding March quarter. The partners are reviewing are “reviewing all strategic options in relation to the future’’ of Hidden Valley. 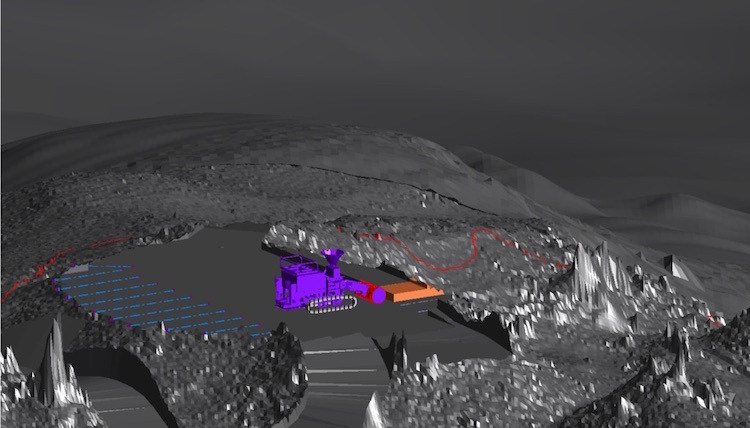 Without further investment in pre-stripping operations, the mine will halt in about 12 months. At the mainstay Cadia mine in NSW, production was down from 203,512 ounces in the preceding March quarter to 178,754 ounces. Premature failure of liners in a concentrator resulted in higher than normal downtime. All-in costs continued to impress at $US394 an ounce. Papua New Guinea’s government is to meet this week for discussions on ownership of major mining and petroleum projects and shareholding in the country. Among the shareholding items which Prime Minister Peter O’Neill says the National Executive Council will discuss is its involvement with Bougainville Copper Ltd.
Last month Rio Tinto gave away its majority shareholding in BCL to the Bougainville and PNG national governments, a move that angered Bougainville which had expected all the shares so it had control of the mine. 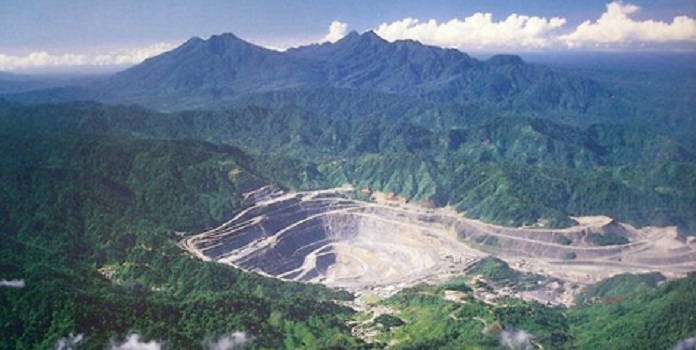 PNG’s government is also to discuss ownership of the Ok Tedi mine in Western Province. 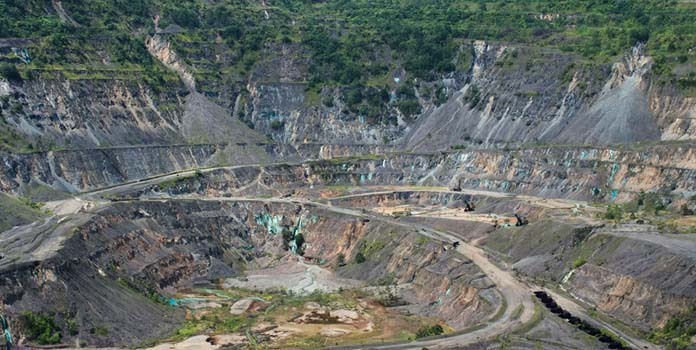 The government had a 37% share in Ok Tedi when in 2013 it moved to take on a majority share by subsuming the 63% stake of the Sustainable Development Programme. The move has been disputed by the SDP in a series of court actions. 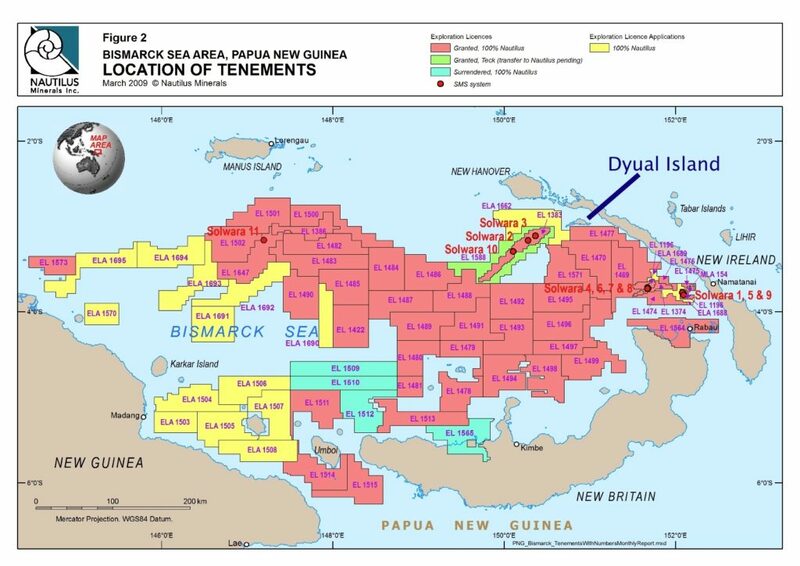 However PNG Loop reports Mr O’Neill signalling an imminent statement this week about both situations, and issues related to shares in PNG’s LNG Project. “I will be making a major statement after that (proposal) has been deliberated by the NEC,” he said. 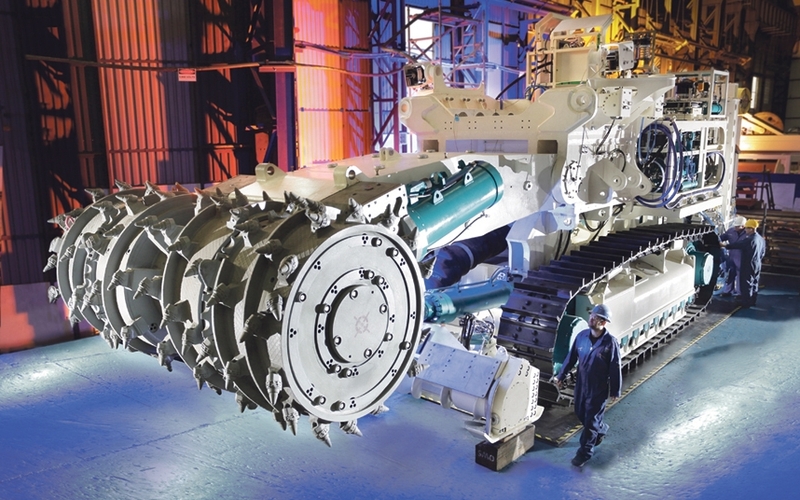 After decades of being on the back burner owing to costs far outweighing benefits, deep sea mining is now emerging as a serious threat to the stability of ocean systems and processes that have yet to be understood well enough to sanction in good conscience their large-scale destruction. In the 1980s, when deep sea mining first became a hot topic, it seemed preposterous to think that humans could up-end planetary processes by burning fossil fuels, clear-cutting forests and oceans, producing exotic chemicals and materials and otherwise transforming – “taming” – the distillation of all preceding earth history for our immediate use. Buried within the Deep Seabed Hard Mineral Resources Act of 1980, US legislation sponsored by Senator Lowell Weicker about deep sea mining, there is a provision that mandates for US interests to establish “Stable Reference Zones” of equal size and quality to those proposed for exploitation. The wording in this law was taken from a resolution crafted at the IUCN meeting in Ashkabad in 1978 that I helped draft and later took to Senator Weicker’s trusted scientific advisor, Robert Wicklund, for consideration. The IUCN World Conservation Congress occurring this September in Hawaii provides a ripe opportunity to set in motion some significant and very timely actions that could help blunt the sharp edge of enthusiasm for carving up the deep ocean. Whatever it takes, there must be ways to elevate recognition of the critical importance of intact natural systems. 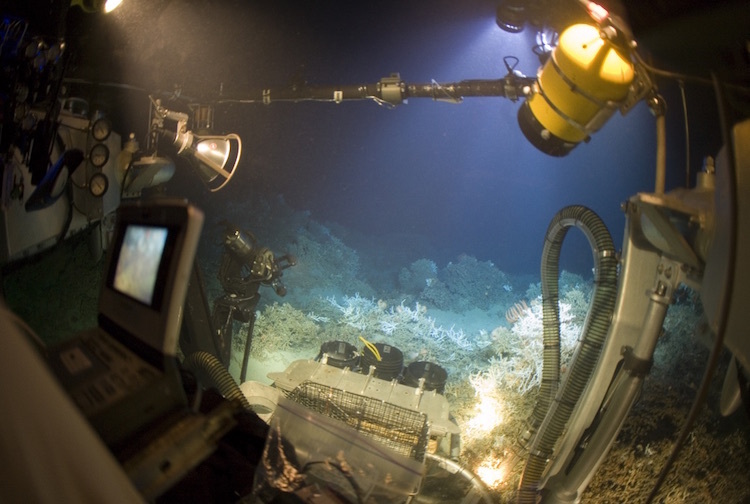 We need technologies to access the deep sea to independently explore and understand the nature of Earth’s largest living system. But most importantly, we need the will to challenge and change the attitudes, traditions and policies about the natural world that have driven us to burn through the assets as if there is no tomorrow. This “as if” can be a reality – or not – depending on what we do now. Or what we fail to do. However, there is undeniably cause for hope: there is still time to choose. This article was published originally on the Mission Blue website; reproduced here with permission. As we have learned the hard way more than once, the biosphere of Earth is interconnected – what happens in one place, affects what happens elsewhere. The seafloor seems so remote to us, yet so did the ozone layer. Humans have a tremendous capacity to modify the global environment, in ways we often don’t anticipate and in ways that are very detrimental to our quality of life. A great many Papua New Guineans are searching for ways to earn K300 per fortnight – approximately minimum wage. The problem is very few jobs are available, especially in the private sector. Many are scratching out a living as subsistence farmers, which doesn’t provide anywhere near the minimum wage. With a far-too-high unemployment rate of 70%, income-producing jobs are few and far between. Papua New Guineans are desperate for opportunities to work for a living wage so they can get past a life expectancy of 58 years. Alluvial mining is one such opportunity. Currently between 40,000 and 80,000 Papua New Guineans are putting in long hours under the tropical sun sloshing gravel around in gold pans to put bread on the table. Some get two grams per day, some five, some more. It’s good money at the current rate of K70 – K80 per gram. Even two grams harvested per day will generate K1500 per fortnite. The price of gold bottomed out at $US1050 per ounce in January of this year and is currently selling at approximately $1360/oz. By the year 2020 (probably much sooner) gold will reach $2000/oz, 50% higher than present levels, which will yield greater value for the self-employed gold worker. The Mining Act of 1992 opened the door wide for Papua New Guineans, allowing them to engage in panning for gold without a license or permit. All that’s required is getting off one’s duff, a gold pan, and a gallon or two of perspiration. Father John Momis is not a happy camper these days. He’s angry that Rio Tinto decided to equally give the Autonomous Bouganville Government and the PNG government the remaining shares of Rio Tinto PNG. He is unrealistically demanding that Rio Tinto engage in a costly cleanup project and then allocate significant funds to re-start Panguna mine. The harsh realities of becoming (or aspiring to become) an independent nation include recognizing that major mining companies are not NGOs coming alongside a nation to help it develop. They’re out to make a profit. They are willing to invest time, energy and resources, but only if they are reasonably certain they will get a return on their outlay. On the positive side, Father Momis can be grateful for the explosion of alluvial miners throughout the length and breadth of his island. In fact, far too many boys and girls are skipping classes and instead helping out dad and mom in the streams and rivers panning for gold. School officials in Bougainville complain that enrollment figures have dropped significantly because of school children assisting their parents in the modern day gold rush in ABG. In the Bulolo district of Morobe Province thousands of alluvial miners are using mercury to isolate the gold they pan. The PNG government needs to get on top of this quickly because mercury is a very toxic substance. Far too many alluvial miners use their bare hands to handle the mercy. They are unaware that use of mercury can lead to damage of the brain, kidneys or lungs and even death. The PNG government needs to ban the sale and usage of mercury, the sooner the better. In various parts of the country the Mineral Resource Authority is pro-actively conducting workshops to inform alluvial miners about the how-to’s of effective gold panning as well as the dangers of mercury usage. Such workshops are well-received and appreciated by locals. The ABG and the PNG government need to think creatively on how to strengthen the alluvial mining industry in PNG. The K400 million from the alluvial industry is nothing to sneeze at. Among nations of the world, PNG’s economy ranks around 150. However, among gold producers, PNG is number 13. Gold provides a sizeable chunk of PNG’s government revenues, for many years exceeding 50% of the budget. 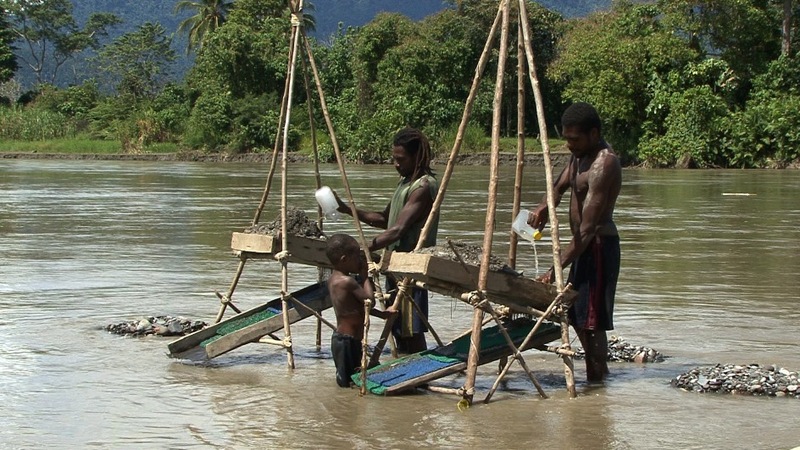 Alluvial mining is a key factor for sustainable development in PNG. Gold panning is much easier on the environment than the large scale mining done by the multi-national mining companies. Guangdong and PanAust are planning to develop a huge copper and gold mine on the Frieda River. It’s about time. For 40 years the Frieda mine has changed hands from one gold exploration company to another, with no one willing to take the financial risk and do the hard work of constructing the mine. I’ve learned from a source on the ground in Ambunti that these two companies are planning to build a huge containment facility to contain the tailings. I hope that’s the case. Meanwhile, under the shadow of the Hunstein mountains in the Frieda area, many locals in villages such as Okisai and Blackwater and Hotmin continue to pan for gold. The Minister for Mining Byron Chan has stated that alluvial mining will double in the five years leading up to 2019. He’s probably right. He states: “The alluvial resource is extensive, under-explored and nation-wide.” It’s a wide open door! 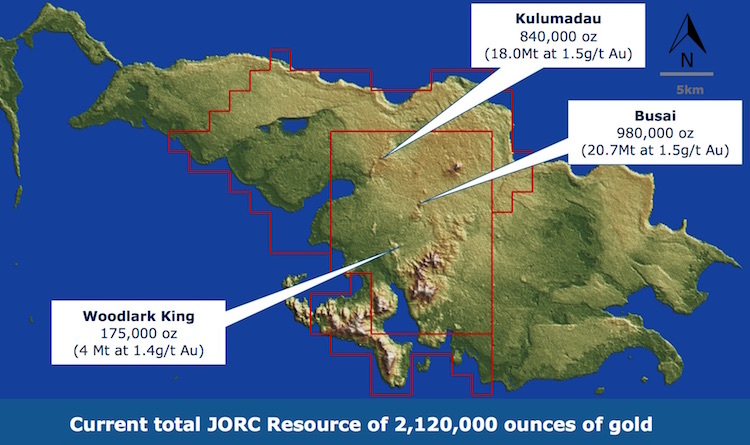 KULA Gold Limited has announced that the company and Geopacific Resources Limited have entered into an earn-in and joint venture binding term sheet on Woodlark Island gold project in Milne Bay. According to a market release, Geopacific has an option to fund A$18.65 million (K44 million) over three and half years to earn up to a 75 per cent corporate interest in the project company, Woodlark Mining Limited. 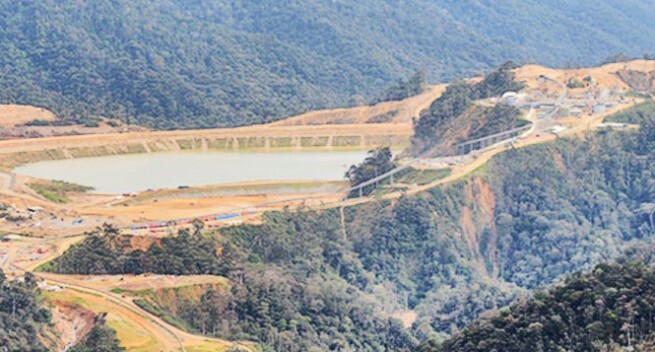 Geopacific is targeting an increase in the Project Ore Reserves to 1.2m oz gold. Geopacific had provided Kula with a full funding option for Kula through to project production. Geopacific has international resource funds as major shareholders – Resource Capital Funds and Tembo Capital who have been supportive of Geopacific. According to Kula, this transaction provided a clear path to production with a substantial investment which would benefit the Government, Mineral Resources Authority, provincial government, local level government and Woodlark Island landowners. The four Bougainville National MPs have been urged to support the Autonomous Bougainville Government’s stand in acquiring the 17.4 per cent Bougainville Copper Limited’s stake given to the National Government by Rio Tinto. The four MPs have remained passive throughout the squabbling over Rio Tinto divesting its 53.8 per cent shares in BCL in the defunct Panguna Mine. The deafening silence by the National MPs has irked a lot of Bougainvilleans who believe the Autonomous Region’s national representatives should be proactive in protecting Bougainville interests. ABG Mining Minister, Robin Wilson has offered a subtle approach by proposing a meeting with the four national MPs by asking them to support the transfer of the shares and to make their case in Parliament and the National Executive Council. “Similarly I propose that the members of the Bougainville Executive Council work with the Regional Member, Joe Lera who is the Minister for Bougainville Affairs to persuade the National Government and the Prime Minister to ensure that the 17.4 per cent is transferred to us,” Mr Wilson said. The action by Rio Tinto has also prompted legal ramifications in the Bougainville Mining Act which brings sections 112(1) and 284(1) into operation. These sections stipulate that if there are dealings in more than 25 per cent of the shares of a company holding an exploration licence then the ABG’s Secretary for the Department of Mineral and Energy Resources must issue the company a notice to show cause.